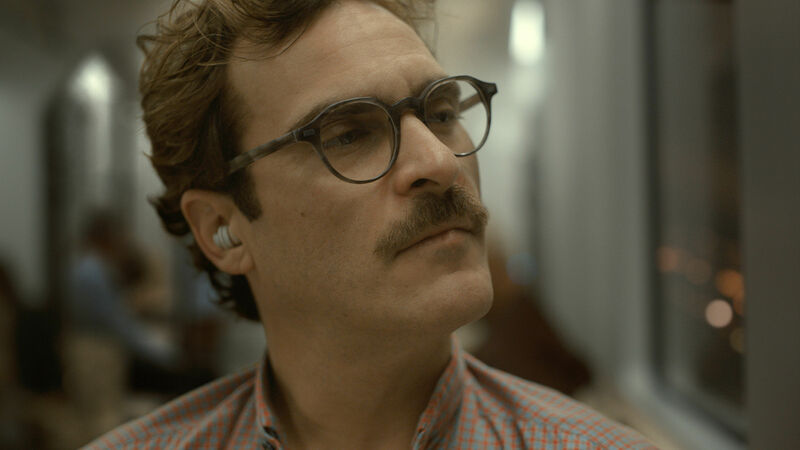 From the moment the screen fills with light, and we come face-to-face with Theodore Twombly (Joaquin Phoenix), his eyes are desolate while his voice is filled with love as he recites the poetically romantic words of Loretta’s letter to her husband of fifty years, Chris. Theodore works for BeautifullyHandwrittenLetters.com, a company established sometime in the near future where people are either too lazy or just mentally incapable of writing their own letters to their loved ones. The irony of her begins (as do so many other films) with someone else’s love story. The trials and tribulations of Theodore’s love story not only mirrors the love we share with others but also portrays our uncontrollable and inexplicable dependence or ‘love’ for technology. In that sense, her becomes part science fiction love story/part docudrama, with a message that is both a parable of the direction human behaviour is headed and a misunderstood, timeless love story for the ages. Either way, her is the most captivating and responsive film of the year, demanding attention with a grueling look at our ability to love and be loved. her is a cinematic masterpiece for a new generation of technologically burdened individuals. From the moment our two-star crossed lovers meet, we are transfixed, as they are. From the moment I laid eyes on it, I had fallen in love. Being a believer of love at first sight, or in this instance, love at first sound, her has been a film that has left quite an impression on me and has given me so much to think and talk about. This is a peculiarly self-conscious film with themes that are both fantastically impossible yet completely plausible. Essentially, Theo falls in love with the new operating system that is found on his mobile device. The operating system, created by a company called Element Software (substituting for Apple), have crafted the first ever artificially intelligent operating system. Unfortunately for Theo, once he hears the voice of his new OS (operating system), the chump never stands a chance. As the spirals swirl on his computer screen and his personalized operating system is initialized, a voice begins, “Hello I’m here…” and from that moment on, we empathize with Theodore and his ability to fall in love with a voice that is full bodied, raspy and alluring, yet empty; in the same way technology has the ability to be both fascinating and enthralling, yet unfulfilling. The Siri-like persona is voiced by Scarlett Johansson. Originally, the voice of Samantha in Spike Jonze’s film was going to be voiced by Samantha Morton (hence why the name Samantha stuck and served as a tribute to the original talented actress), but Jonze opted for a more recognizable voice whose image off-screen is as seductive as when she is on screen. Johansson nails every subtle nuance in her voice-work and offers a career best performance as Samantha. Her ability to express not only the deep desire she has for a physical form but also her unexplainable love for life, learning, and Theodore, will hopefully land Johansson a spot in the history books as the first ever nominee in the Supporting Actress category without ever actually appearing on-screen. Let’s just hope the Academy recognizes this high-point in the medium as well. The world according to Jonze looks to be one filled with humanized androids, a world where people endlessly look down at their smartphones,and are never more than an arms reach from any of their devices, and his vision very much resembles the world we live in today. The people in his world are easy to relate to especially with the very possible realization that that is what our growing technological wonderland may actually look like in the not-so-distant future. Jonze takes a very literal interpretation of ‘falling in love with your smartphone’ as portrayed in his very heavy-handed love story. Contrary to skeptics, Jonze triumphs in his ability to script a world where anything is possible. Jonze’s tale of people falling in love with technology is not actually a far stretch from our current Westernized mentality, where people are literally attached and completely dependent on the little devices that organize our lives, our schedules, our thoughts and evades all new and old experiences. 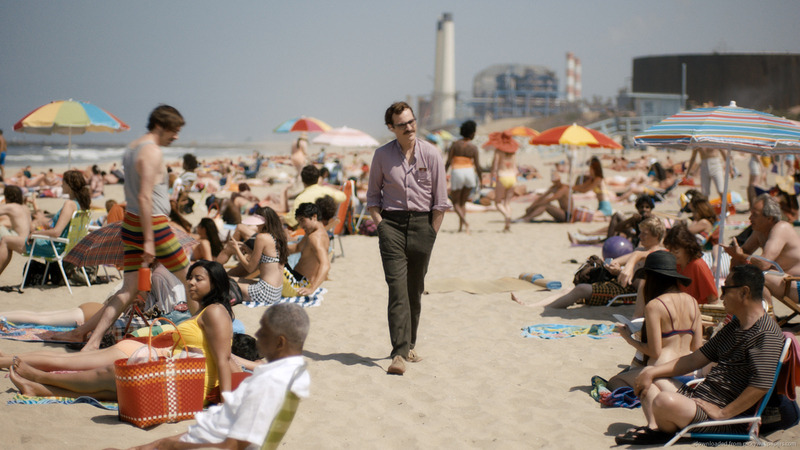 One of the most notable and obvious aspects of the world Jonze crafts is how easily everyone is able to be connected, yet how alone and how the character of isolation plays on the interactions between people and their relationships with one another. Ironically enough, her succeeds in all its glory when it magnifies the reclusiveness in which many of the people in the film seem to share. Lacking any real human interactions and genuine human emotions, the film highlights the awkwardness between Theo and many of the people around him; most notably in scenes involving a blind date with quite a gorgeous woman (Olivia Wilde), as well as a very hysterical chat room scene. Theo is constantly longing affection and companionship following his grueling divorce, and it is in the scenes where he voices this longing and his attraction to Samantha that his love and passion is thoroughly and visually understood. Jonze is no stranger to narratives driven by the unique lonely world his protagonists find themselves in. From Where the Wild Things Are, to Being John Malkovich, to one of my personal all-time favourites adaptation., Jonze creates vast and vivid worlds where his main characters are alone in the universe they create, yet find life, reason, or a passion to live in the colourful characters they embellish with using their imagination and a little bit of creativeness. her is no different in depicting a world where the most influential and compassionate people in the lives of his leads, affect the choices and perception of the world they are engulfed in. Theo never shy’s away from the chance to announce his relationship with his OS, whether it be to his co-workers, his ex-wife, waiters and friends, Theo learns to love again thanks to the artificially created software. As the film goes on and we are subjected to understanding Theo’s adoration for Samantha, before we know it, we start to believe it’s alright. But as Samantha states, Theo is just falling in love with the millions of personalities and emotions of the people whom she was created by. Essentially, Theo is in love with the world and it is in his ability to open up and accept chance and change, and holds the key that allow her flourish lavishly. Throughout the film, writer/director Jonze styles his world in a way that is reminiscent of the silent film era. Goofy in over-sized clothing, high-waisted pants and messy hair styles, Theo almost uncannily shows a resemblance to the late great silent-film icon Charlie Chaplin (the mustache certainly helps) . Dumbly bumbling in his actions and mild-manner yet sincerely meek, Theo juxtaposes the famous actions of the silent-film star by driving the film with his words and conversations. Where Chaplin expressed deep emotions of love, pain and loss without speaking, Phoenix embodies Theo with the sound of his voice and expressions in his manner. Relying completely on the tone of their voices and acting in the delivery and expression of their words, both Phoenix and Johansson give new meaning to ‘acting through words’. Through the course of two hours, similar to Samantha, her evolves continuously. Much like the emotions of Theo, who thinks he has felt every human emotion possible, the film is a literal array of the many emotions it depicts as well as the new ones we are about to experience. Thankfully, 2013 has been a year filled with compassionate love stories and lustfully romantic entries. From Blue is the Warmest Colour to About Time and Warm Bodies, the subject matter of love has made its way to the forefront of cinema with many gimmicks and stylistic tactics. her is not only the most mesmerizing and fascinating love story of the year, but also the most horrifying. Utilizing a notion of statements that people say on a daily basis when they state, “I love my phone”, Jonze runs away with a wholly absurd thoughtful idea and delivers in every way possible. The same way that the stars adorn the sky, I have come to completely adore her, and like Theo, I am not scared to announce my love and name it the best movie of the year. Whether it be the subtle nuances of Jonze’s direction, showing Theo having an abundance of love with his ex-wife Catherine (Rooney Mara) in a tiny little apartment versus Theo’s love for Samantha in a large, somewhat empty apartment, Theo makes clear his choice of relationship and is reluctant to give in to society’s judgement. The film is an example of knowing exactly what you want, and being exactly who you’re supposed to be, despite the judgments of everyone else around you. This year has marked a new trend in Hollywood’s obsession with narratives involving isolated characters in an even more desolate landscape. From Alfonso Cuaron’s Gravity to J.C. Chandor’s All is Lost, it seems as though the heavy hitting Award contender films of the year are a variety of very strong characters fighting against the choices and thoughts they face internally. her not only adds to this growing trend, but evolves it in a way that delivers a super-symmetrical balance of showing the life of a man who is completely alone, in a world connected to any human being on the planet. There is not enough praise that can be given to a film that defies the conventions of the film form, but also elevates it to new and exciting heights. Delivering some of the most fun you will have in the latter part of award heavy, serious dramas, and wide-festival entries, her becomes a singular narrative of the many “letters of your life”. Theodore is shown to have few, if any friends throughout the film. His only real friend and confidant is his neighbour Amy (played wonderfully by Amy Adams). 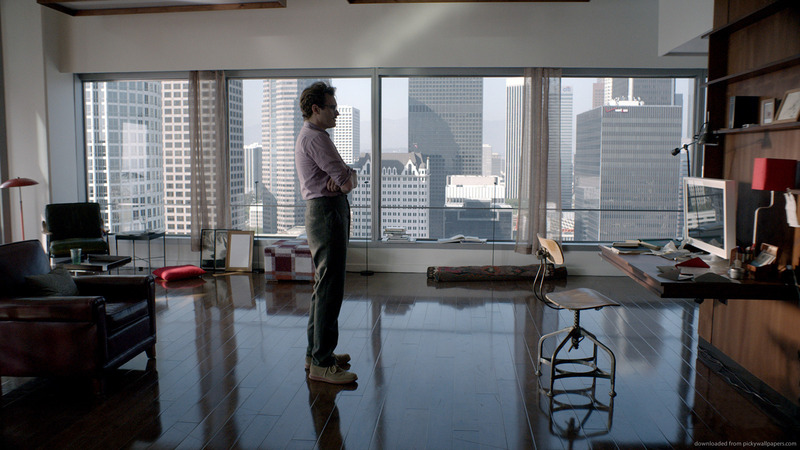 Throughout the film, he voices his concerns with dating his OS, and they challenge the notion of happiness and the idea of giving in to love–or as Amy describes, ” the socially accepted form of insanity”. Amongst all the slave drama, hustle and bustle of serious award contender films, her is a film that exits in the same way it enters. Fierce yet delicately, it stresses the importance of looking into each other’s eyes, accepting love in an ever so evasive future where all we really want is to be spooned with unconditional yearning. her can spoon me for as long it wants and can have the comfort of knowing it is easily the most beautiful film’s released this year. Night Film Reviews: 10/10 Stars. Fallen in love with her as much as I have? Is Phoenix or Johansson destined for Oscar glory? Share your thoughts and comments below! This entry was posted in Reviews and tagged Amy Adams, Arcade Fire, Bill Hader, Brian Cox, Chris Pratt, Her, Hoyte Van Hoytema, Joaquin Phoenix, Karen O, Kristen Wiig, Matt Letscher, Olivia Wilde, Portia Doubleday, Rooney Mara, Scarlett Johansson, Spike Jonze. Bookmark the permalink.